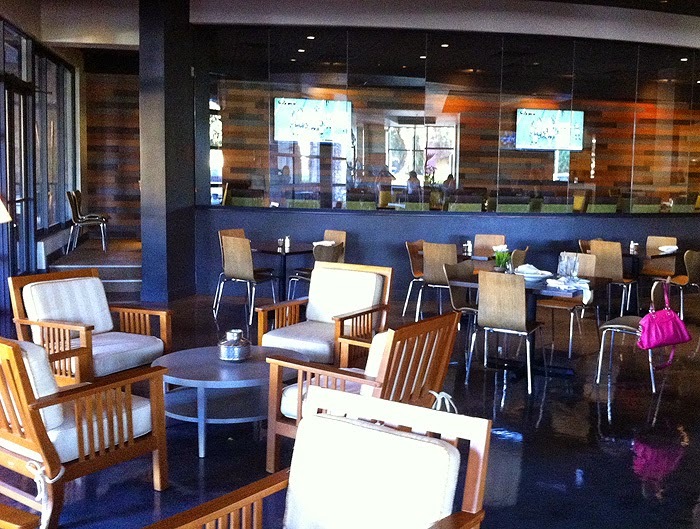 I recently had the opportunity to check out The Standard, a new restaurant in Scottsdale described as “a friendly place with a focus on healthy, simple food in a comfy lounge atmosphere.” A unique concept that serves breakfast, lunch and dinner and also has a market side for folks who need to grab a quick bite to eat. A great place to meet for drinks; they have an inviting spacious outside patio with a full bar in addition to the bar inside. They also have a private dining space and offer full off-site service catering services (they pretty much do it all!). We started our dinner with a few of their signature cocktails. Due to having the market side with fresh squeezed juices they can incorporate these into a fun selection of specialty drinks. We started with the Standard Bloody which included fresh carrot juice and the Sonora; a twist on your traditional margarita with hibiscus. Both very interesting combinations. They didn’t allow us to try just one. We also had the disco lemonade, with green tea and mixed berries and the shakermaker, similar to your traditional mojito. Very refreshing beverages! After exploring the dinner menu and a few suggestions by the owner and our wonderful server, we started with the Tuna Crudo. 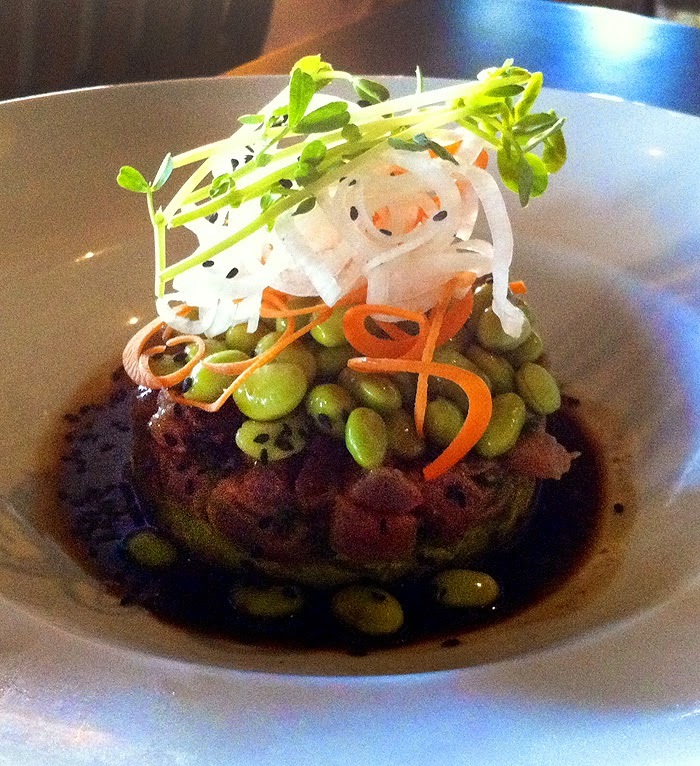 A beautifully presented appetizer with layers of wasabi infused guacamole, fresh tuna and edamame, topped with daikon, carrot and watercress. A delicious and impressive start to our meal. 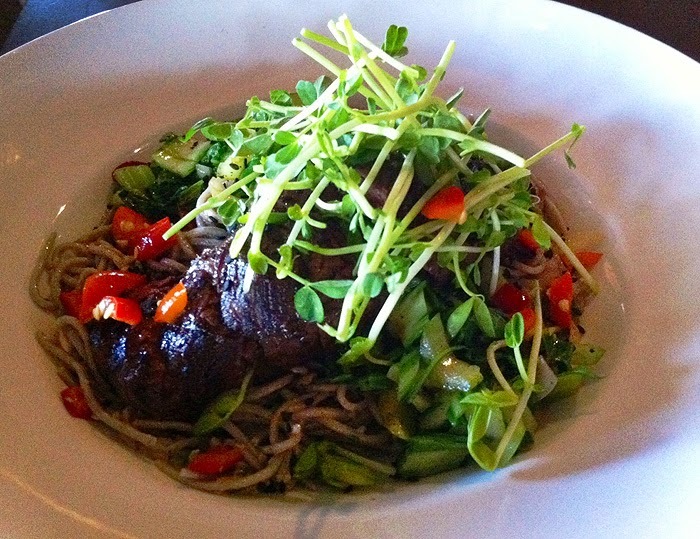 Next up, the Soy Glazed Beef with Soba Noodles. A nice serving of grilled hanger-steak atop buckwheat noodles with bokchoy, onions, peppers, cilantro and tossed with a lemon vinaigrette. A nice, light Asian-inspired dish. 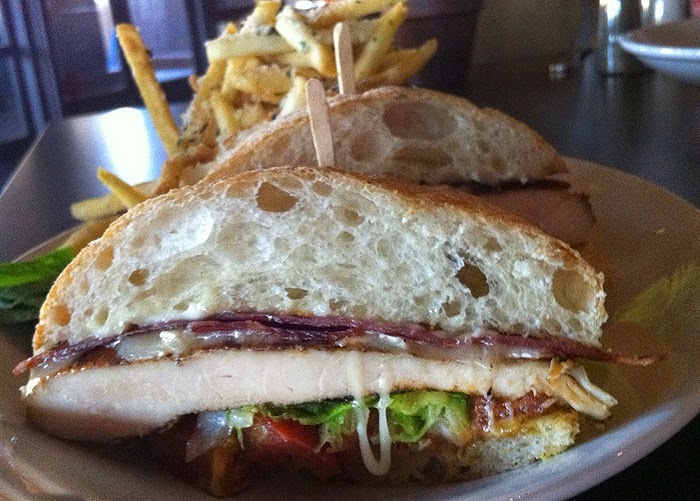 To give us a sampling of something that can be ordered from the market side we tried the Brick Chicken Club Sandwich. Stuffed with chicken, turkey bacon, black forest ham, caramelized onions, melted Brie cheese on the softest ciabatta bread I’ve ever had. Not to mention the heaping pile of shoestring frites sprinkled with garlic, herb and Parmesan. What is not to like?! 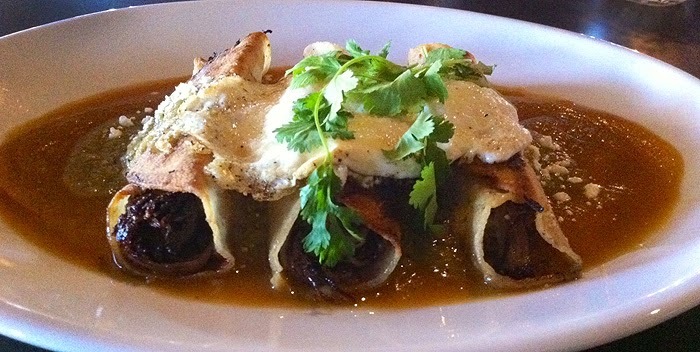 Then we had to try the Tri Tip Sirloin Enchiladas. Corn tortillas filled with shredded top sirloin, smothered with green chile and butternut squash puree, and topped with cotija cheese and a fried egg. The butternut squash gave it a slightly sweet and spicy flavor. Um…YUM! We couldn’t leave without trying desert, baked by their in-house baker who makes yummy treats you can also pick up in the market. 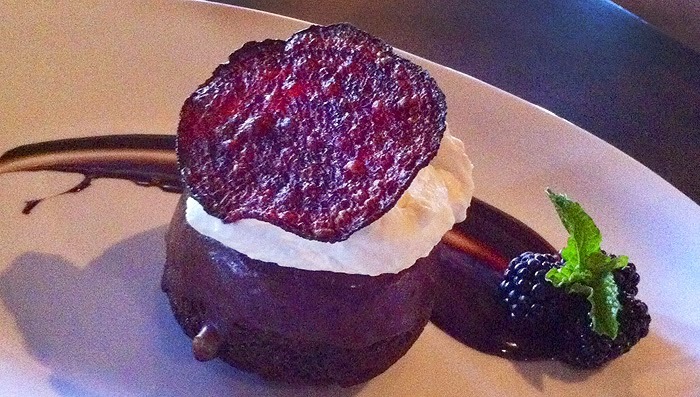 We shared the chocolate beet cake topped with fresh whipped cream and a sweetened beet chip and an orange shortbread cookie served with their caramel gelato. They were both delectable and finished off our meal perfectly. The Standard offers something for everyone at nearly any time of day. Stop in the market for breakfast or lunch on-the-go and enjoy made-to-order food, fresh juices, smoothies, and an espresso bar. If you have time to relax, sit down and enjoy a drink and one of their staple salads, sandwiches, burgers, or try one of their Asian or Southwestern inspired dishes. 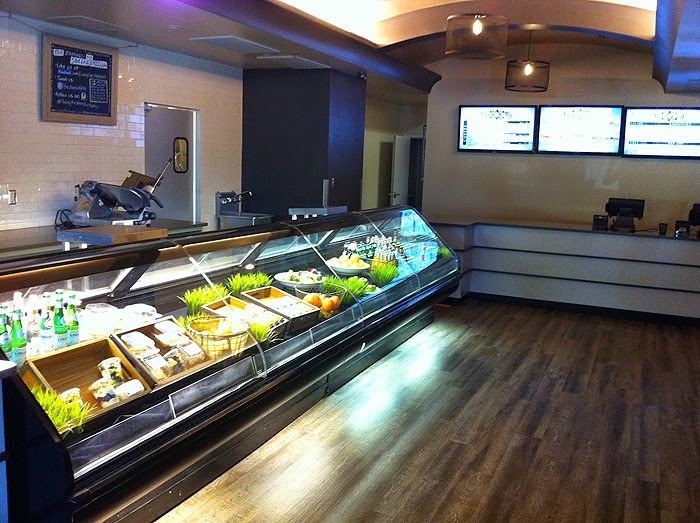 Indeed this is a comfortable, friendly place that feels just like home and is sure to please any palate! Don’t miss it tucked behind the California Pizza Kitchen off Scottsdale Road and Gold Dust Avenue. OK I want everything on that entire menu! OMGoodness those cocktails look amazing. I really warmed up to restaurant photography and it's so much fun! I love it when you eat at a restaurant and you have to decide to I eat it or just sit and look at it because it is so beautiful! The food looks delicious and it appears that you had a great time! Looks like a great selections of food and drinks! Lovely presentation too. I would love to visit! This looks like my kind of place! Bookmarking for a future visit. Thanks for the rec! Sounds like a nice restaurant. That Brick Chicken Club sounds amazing! If I ever make it to Scottsdale - I'll definitely pay them a visit. The food looks fantastic! I'll have to let my boyfriend know about his place. His brother lives in Scottsdale. 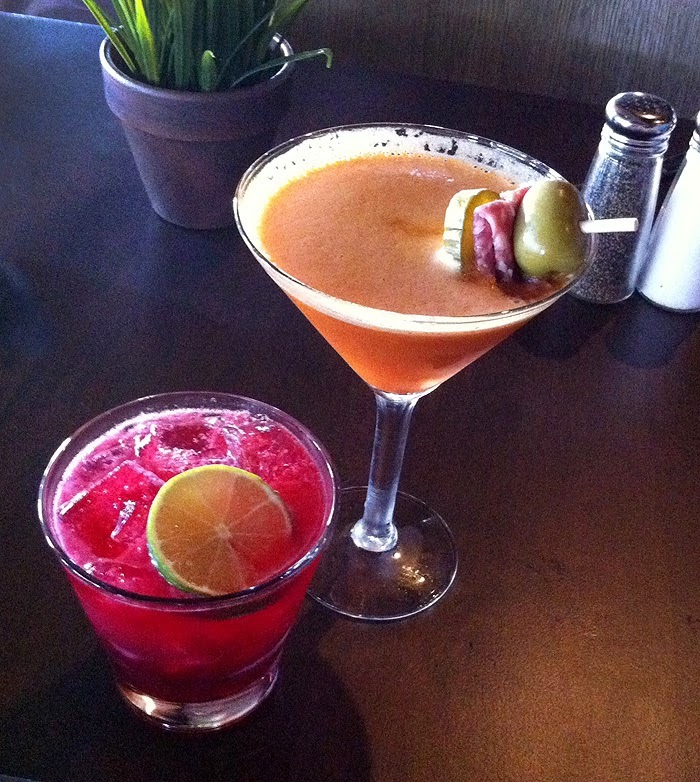 Looks like an awesome night of dinner and drinks! Sounds like a fantastic restaurant! If I ever make it to Scottsdale, I'm definitely dining there. Ooh, I'll have to tell my friends in Scottsdale about this restaurant! Those drinks, the food - I want ALL THE THINGS!! Now I have to make my way to Scottsdale! Well...I sure wish I lived near Scottsdale!! !